A little over a year ago, I wrote about Colterris. 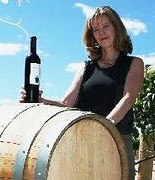 At that time, Colterris was a custom cabernet sauvignon made by Two Rivers Winery for High Country Vineyards and Orchards proprietor, Theresa High. A lot can change in a year. Colterris is still (for now) made at Two Rivers, but Colterris has its own winery license and has expanded (will continue to expand) its family of wines. Currently on the market, you will be able to find both a cabernet sauvignon and a cabernet franc. Theresa has taken on more responsibilities as winemaker and will release a petit verdot and Meritage blend in the near future. Colterris is one of the most widely distributed Colorado wines in the state (a testament to its quality, but also helped by Theresa's husband owning a wine distribution company), so grab a bottle (or two) and get to know the woman behind this popular and tasty wine brand! I have always had a passion for the history and romance of wine. Soon after graduating from the University of Arizona with a degree in Marketing I set my goals to learning as much as I could about the sales, marketing and wholesale distribution of premium wine. When my husband proposed to me, he said he could not promise me a ”rose garden” but that he would promise me a “vineyard”. We have enjoyed traveling the world of wine together looking for the perfect place to plant that vineyard since 1985. Fifteen years later, in November of 1999, Scott made good on that promise to me and the “rest is history” or should I say “my future.” Today we have 126 acres of fruit orchards and Vitis vinifera wine grape vineyards on East Orchard Mesa in Palisade, Colorado. I am moving forward with the mighty endeavor of winemaking, production and sales of my Colterris private label, produced from the grapes of these world-class estate vineyards. I would be working in some sort of sales management opportunity navigating the pathway to planting the vineyard of my dreams! I am sharing my time between our three children ages 14, 22 and 29, managing the sales and operations at High Country Orchards & Vineyards, traveling with my husband and I love to cook pairing food, fruit and wine. My goal is to make a “signature” Bordeaux-style wine consisting of the very best estate-grown grape varieties from our family vineyards. This wine will be a blend of Cabernet Sauvignon (Theresa’s vineyard), Cabernet Franc (Katie’s Vineyard) Peitit Verdot (Two Brothers Vineyard), Malbec & a Merlot (still to be named vineyard). My first vintage of Petit Verdot was harvested this fall and will be racked into American Oak for aging. Probably Bordeaux or Provence because this is where I first found my passion for wine. Red wine, fruit forward, bold, fresh, interesting! There is a whole NEW world of wine in Colorado yet to be discovered. A great place to uncover “new finds”. For those who consider themselves pioneers and enjoy taking risks and trying new things this will be a rewarding adventure. I think we will be making fantastic big red wines in the French and South American styles with a variety of deep complexity, fruit and spicy characteristics. The Colorado Wine Region will have a standing reputation for producing great Cabernet, Malbec and Bordeaux blends. Will you be surprised to someday soon find Colorado Wines listed among the best of the world-class award winning wines?